It was standing room only in the Anna McDowell Garden Room at Gold Hill Museum for the official launch of the ‘Shaftesbury Remembers’ website created by The S&DHS Great War Community Project team. 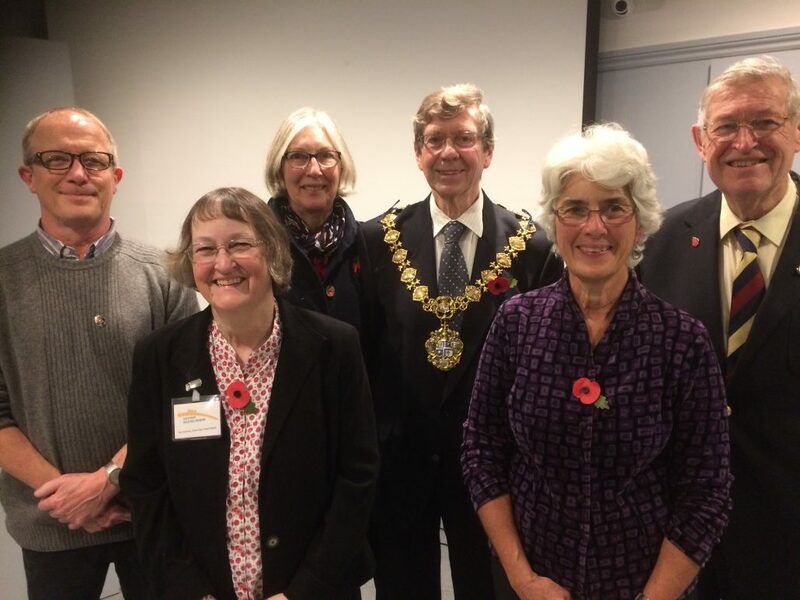 Ninety Project contributors, accompanied by the Mayor of Shaftesbury and Mrs Lewer, saw the website demonstrated by designer Rob Frost (far left) and explained by Project leaders (from left to right) Ann Symons, Claire Ryley and Chris Stupples. Heritage Lottery Funding and a huge amount of voluntary effort have gone into creating an archive of the stories of people commemorated on 25 local war memorials and of information about contemporary life in Shaftesbury and district. Participants also enjoyed tea and cake, and were able to view folders of stories, documents and artefacts collected by the Project. Work continues to find details about individuals hard to identify, and to input the stories of those who came back.